CMDA Delegate Visited the U.S. Invited by the National US-China People’s Friendship Association, 12 CMDA delegates from 6 provinces and cities led by director of CMDA Xia-Men Medical Doctor Association Cong-Yun Cui visited the United States from May 27 to June 7, 2007. During the trip, the delegates met with the National U.S.-China People’s Friendship Association, the Medical Society of the State of New York (MSSNY) and the U.S.-China Economic and Culture Development Alliance, and visited the NYU Medical Center. At the meeting with MSSNY, the two organizations first introduced each other’s functions, structures and main objectives, and then exchanged ideas on interested topics including medical ethics, the relationships of CMDA, hospitals and doctors in China and China’s medical related policies and regulations. To give the delegates a better understanding, president of New York County Medical Society Zebulon Taintor provided background information on the medical system of the U.S., the licensing and training of doctors, breakdown of doctors’ income and the public and private medical insurance systems. Dr. Martin Gittleman showed particular interests in CMDA’s efforts to improving the medical services of rural areas, and expressed intention for cooperation. It was agreed that the visiting was very successful. Not only CMDA established relationships with the U.S. medical communities, but also get a better understanding of the development of the U.S. medical systems and the doctors’ licensing and training systems. All delegates believe that the experiences provide great inputs to improving CMDA services for doctors and public health care. 2013 CORE (China Outcomes Research and Evidence Based Medicine) Summit was successfully held this month in Shanghai Gran Melia Hotel. Since its inaugural event in 2011, CORE Summit has attracted increasing number of experts, speakers and delegates from within and outside of China each year, and has become one of the most important events in promoting evidence based medicine in China. At this year’s conference, Director of AHRQ, Carolyn Clancy, MD, Director of Epidemiology of FDA, Danica Marinac-Dabic, MD, Senior Executive Editor of The Lance, William Summerskill, MD, President and CEO of Joslin Diabetes Center of Harvard Medical School, Mr. John Brooks, were among the distinguished speakers from the international communities. There were clearly increased interest and attention on health economics and big data related topics, represented by both the level and capacity of the speakers and the level of enthusiasm and knowledge among the audience.The most discussed topics included social insurance and pricing, policy and reform under the new administration, as well as electronic medical records, hospital consortium and partnership, and clinical outcomes data collection. 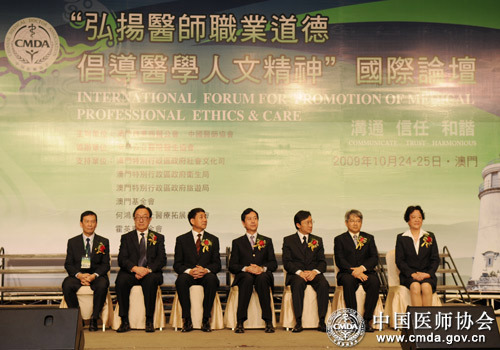 During Apr 7 to 12, 2007, as invited by Japan China Medical Communication Center (JCMCC), CMDA delegation visited Japan Medical Association (JMA), Tokyo Medical Association (TMA), JCMCC, Kyorin University Hospital and Towa Hospital senior care center. CMDA Vice President and Secretary General Dr. Jing Yang led the delegation of 16 members coming from 6 CMDA sub-associations. At JMA Tokyo office, the two associations had exchanged each other’s functions, organization structure and major objectives. Then the delegation met 11 TMA directors at TMA Tokyo office, where both parties had detailed understanding of each other’s functions, organization structure and services offered. The delegation also visited Kyorin University Hospital and Towa Hospital senior care center. Established in 2004, China-USA MPHI continues to grow and provides a potential regional base and experience to evaluate efforts across the MPHI mission spectrum. Copyright © 2017 Chinese Medical Doctor Association All rights reserved.